Toys: Four Hits and Four Misses for Our Kids | Let’s Dad This. When we first became parents, it was so easy to get caught up in the whole process of finding the “right” stuff for the kids. Toys, games, learning tools, accessories. But there were so many options! How do you know what your kids will love or what you’ll end up actually needing? Let’s start with toys today. I could write a whole separate article on baby gear, and probably will. But toys are big expenses, and I don’t feel like we always have the opportunity to know what will be awesome until it’s too late. For our kids, we hit a lot of moments where we knew we had spent our money on the wrong things. Still, there are some toys that our kids continue to play with, even after having them for seven years or more. Here are our four greatest hits with toys, as well as four serious misses that we thought would have been perfect. When my son was in the after-school program in kindergarten, they had a set of these nifty magnetic tiles in various shapes. He was building skyscrapers, castles, cages, and cars with them, and he was having the time of his life. That Christmas, we invested in them for our home, and it’s been a constant fixture in the kids’ creative play ever since. It doesn’t matter the age, everyone loves them. Our daughter is just as into them as our sons, and they take a serious beating without ever breaking. The official MagnaTiles are awesome, but even better is that if you can’t find them, you can get Picasso Tiles as well, and they are all compatible. There are plenty of different shapes and colors, and even some out-there options for the truly creative builder. Worth every penny. I had Legos when I was a child, and they were cool, but they weren’t my very favorite. But for my kids, they are pure playtime gold. Not only do we buy many sets, but we also just have buckets of random pieces that I had from my childhood and that we’ve purchased in basic collections for the kids. Our favorite sets are the City sets—cars, trucks, helicopters, airplanes, etc. But we’re getting to the point with our oldest where we may be looking at more advanced builds. Our younger kids just like building whatever pops into their imaginations, but they can all focus in and use instructions well, especially with the Junior sets. Even better: if you have old sets but have lost the booklets, almost all the instructions are available online in PDF format through Lego.com. I wanted to keep this one more open, since art at our house is a crazy-wide category. Almost anything art-related is worth a purchase at our house, and the kids spend a great deal of time creating and making. While we use plain printer paper for most of our projects, we also like using larger sketch pads and heavier paper like card stock for many of our paint-related projects. We also like construction paper, but plain white paper is almost always the first choice. For supplies, we love anything Crayola, especially their crayons, markers, watercolors, and tempera paints. For colored pencils, we’ve bought a couple different sets, but Prismacolor sits at the top of the list. We also like working with 3D creating, so Crayola’s air-dry clay is a hit. Kids also love working with pipe cleaners, beads, and craft sticks to create unique pieces. Honestly, though, kids can create with basically anything they’re given, including leaves and branches, rocks, or even dirt. Just give them some Elmer’s Glue and let them go for it! These big vehicles are just plain awesome. With plenty of moving parts and sturdy construction, our kids pretend with them endlessly. The big basic trucks, like the garbage truck and dump truck, give the most sturdy foundation for small play (our little, 16 months now, rolls them around like mad!). The company also offers more complex tractors, loaders, and construction equipment for older kids to manipulate and maneuver. While they’re a little expensive, they are nearly indestructible and offer great options for open-ended play. They’re not technically toys, but the Amazon Fire Tablets for Kids are awesome for our littles. We bought our oldest a Fire HD7 a while back, but now we’ve got HD8 tablets for all three of the big kids (the HD7 has now been inherited by our youngest, just so he deosn’t feel left out!). The Kids Edition is the best deal for the tablets. It comes with a protective case in various colors and a one-year subscription to FreeTime Unlimited, Amazon’s kid-friendly app-sharing service. As Prime members, this is a no-brainer, since it’s all integrated into the Amazon membership we already use for basically everything. The price is good on a daily basis. If you time it just right, though, you can land some great deals on these tablets, especially if you’re buying them in pairs. They’re not as solid as an iPad or Galaxy tablet, but they are sturdy and user-friendly for kids. Even better, you’re not spending your whole existence worrying about the kids breaking them. Our kids have never broken a screen or dented the casing! The biggest drawback is the minimal internal storage, but you can buy a large memory card to remedy that for a very small cost. You can set the system to store everything on the memory card that can be stored there, making it much more usable in the long term. Perhaps it’s because we have three boys and only one girl, or perhaps it’s just how our kids play, but our daughter never got into dolls, especially Barbies. It was a sad day when we decided to get rid of the awesome dollhouse and all the Barbies we had because they were simply collecting dust, but that was all they were doing in our home. Nevertheless, we think these are awesome toys for most kids. The official sets are great, but we also love some of the sets that are offered beyond the core Barbie brand. With plenty of options for girls of all cultures, backgrounds, and interests, Barbie is a lot more than the single doll that started the craze so many years ago. We also found that bigger dolls weren’t a huge hit. Our daughter now has only a single American Girl doll, and she loves it. But nothing else made the cut. Dressing up the doll in clothes and accessories is the biggest draw, and there are great options for homemade and custom clothing sets. Our kids love playing with pretend food and cooking utensils. The big kitchen sets were not the hit we thought they would be, though. We had an awesome KidCraft Kitchen for our oldest two. While they played with it for a while, it soon became a storage unit for the kitchen tools, pots and pans, and plastic foods. Great idea. Not-so-great reality. We ended up getting rid of the kitchen set to replace it with plastic storage bins the kids could carry wherever they wanted to play. We even tried a second smaller kitchen set later on that ended up in the same result. Our oldest is super creative in terms of STEM and STEAM, so we thought something as cool and unique as the OzoBot would be ideal for him. Once again, we learned the hard way. After trying a few times to play with this little programmable robot, our son lost interest. It’s still sitting in his room, but it’s probably going to get sold or given away. Again, awesome idea, but the play out in our home was less than successful. I know others would think it’s just great, but it wasn’t the right fit for our kids. Really, our kids love wooden toys. We love Melissa and Dough to death. But the truth of the matter is that large, heavy, wooden toys often become projectiles more than imaginative play tools. And that doesn’t fly. For example, we had a great set of wooden pots and pans for our kitchen. They were sturdy, great to work with, and fun to use. But they also made for some very dangerous projectiles in the hands of a two-year-old. We also had some cool walk-behinds that were given to us. We thought they were totally great, but our kids weren’t into them. If there’s anything a parent hates, it’s noisy toys that aren’t played with like they’re supposed to be. 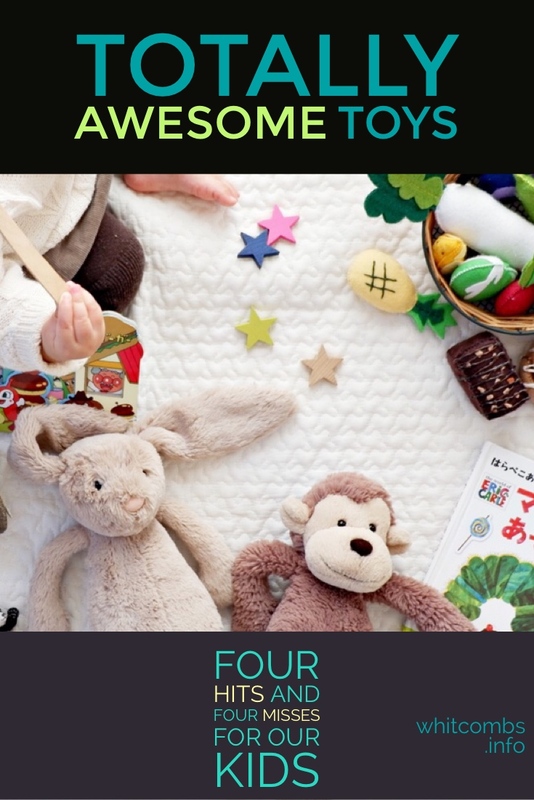 Learning toys, stuffed animals with sound effects, activity tables, you name it. Those noisy toys can be the worst. Our kids didn’t find them particularly entertaining, so there were moments when the only use they got was a kid mindlessly pressing the same button over and over again until we would lose our minds. Or we’d see them turn the toy on, get it going, and then leave for another toy somewhere else. For some, these toys are great. In other homes, they offer a stimulating and enjoyable experiences. But for us, they’re just another source of noise that no one wants to play with. Decluttering: Why It’s Awesome for Your Family! In our home, toys are about imaginative, open-ended play opportunities. If you have to play a certain way, the toy is dead in the water. We have found that if you give the kiddos a chance to recreate the experience in hundreds of ways, you’ve got yourself a true winner. The good news is that every family is different, so your kids might find some of our misses to be absolute hits, and vice versa. Watch your kids play and see what they’re into. See how they use the toys they already have. Kids have a funny way of seeing things differently from us grownups, so don’t get caught up in what you think would be cool. They probably have a better idea, anyway!